Since branch offices are far more numerous than the mainframe sites, the elimination of the X.25 hardware at the branches results in the largest cost savings and increased line speed. 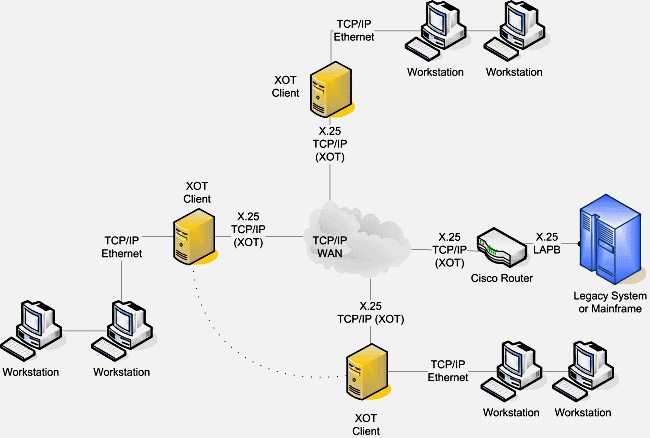 Since the X.25 PLP data are encapsulated into TCP/IP, the X.25 packets can be extracted and processed by an X.25 PLP module. 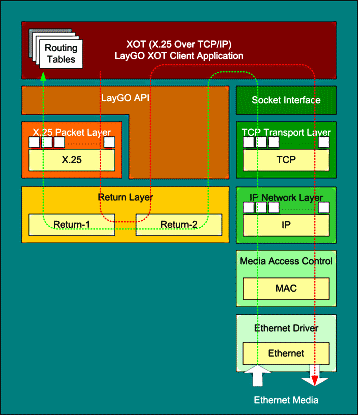 At the receiver, the X.25 packet is routed to the lower edge of the packet layer using the LayGO Return Layer. They are then decoded as if they had arrived from the LAPB or LAPD layer. At the transmitter, the X.25 packets are routed from the lower edge of the X.25 packet layer to the XOT client using the LayGO Return Layer. The XOT client also emulates the LCN0 traffic. The LayGO application is unaware that XOT is used. 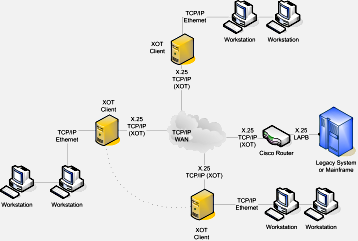 In addition to XOT, RPC can be used to support multiple local or remote simultaneous processes.